Few people consider the negative effects of prolonged use of steroids and even less perceive them as addictive. Because they lack the typical euphoric feeling other drugs offer, users tend to ignore the health risks that come with steroid abuse. But, the reality is that these synthetic drugs can be quite dangerous and have a significant impact on people’s lives. this type of steroid helps improve strength, build muscle mass, reduce body fat, and increase athletic performance. Let’s just make one thing clear: any medication can cause negative side effects, especially if patients take them recklessly. The same stays true for steroids. In the case of anabolic steroids, patients are so focused on the apparent “positive” effects, such as performance enhancement and improved physical appearance, that they ignore the warning signs. Because they want to maximize the benefits of steroids intake, patients often increase the dose without realizing that’s a slippery slope. Additionally, men can experience the development of breasts and impotence, and women can experience facial hair growth and a deepened voice. Steroid addiction has been associated with cardiovascular complications, such as heart attacks or strokes. While steroids do not trigger a brain response as fast as other drugs, they do create significant changes over time. These alterations can impact the way neurotransmitters work. What Are the Dangers of Mixing Steroids with Alcohol? On their own, anabolic steroids already have several negative effects on the overall well being of a person. Mix them with alcohol, and these effects are amplified. Alcohol already has a strenuous effect on the liver, but in association with synthetic drugs, it can become even more difficult for the organ to process these substances and flush them out of the system. Habitual use of steroids and alcohol can also affect kidney function. According to one study, bodybuilders who have taken steroids for many years and combined it with alcohol developed proteinuria or protein leakage into the urine. Typical symptoms of concurrent anabolic steroid and alcohol use are irritability, delusions, aggressiveness, mood swings, concentration and memory issues, lack of coordination, or acne. Men can also experience infertility issues, testicular shrinkage, baldness, or breast development while women can experience excessive facial hair, a deeper voice, or menstrual cycle issues. Can You Overdose on Steroids? 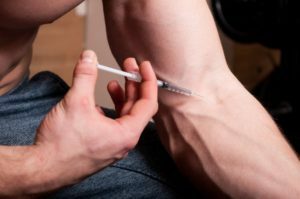 Both corticosteroids and anabolic steroids can lead to addiction and as users increase the dose to heighten the desired effects, the risks of misuse and, consequently, overdose increase. Because corticosteroids and anabolic steroids are so different from one another, the symptoms of overdose will also vary significantly. An anabolic steroid overdose manifests itself slightly different because of the drugs’ composition. Corticosteroids are similar to cortisol and are used for altering immune and inflammatory responses. Anabolic steroids, on the other hand, are created in the laboratory and work similarly to testosterone. Because of this, overdose on anabolic steroids doesn’t occur in one sitting but is instead a result of long-term use. Symptoms and effects include mood swings, aggressiveness, irritability, delusions, increased blood pressure, heart issues, kidney and liver damage. Reckless and prolonged steroid use can often lead to abuse and addiction. But, because users don’t consider them as drugs, they tend to ignore the negative consequences. Staying informed and understanding the risks associated with long-term use means staying safe. Illegal use of steroids is a serious issue not without its own consequences. Maybe it began as a way to boost your ego. You saw quick results in the way that women started to take notice—you were bulking up, and fast! Often the next chapter, though, was realizing you could not stop taking them. The solution to ending steroids addiction was elusive, along with all the other problems that seemed to pile up. In many cases, you didn’t know how to quit taking steroids, and it spiraled out of control in ways you didn’t think it could . . . alcoholism, heroin, meth or prescription painkillers. If this sounds like your situation—or one of another young man you know—Windward Way’s addiction treatment program is here to provide lasting results. Call now: 855-491-7694. When men discover they are not only addicted to steroids, but also suffering from a crippling addiction to opiates, amphetamines, alcohol, or prescription medication, Windward Way offers lasting answers when other rehabs simply rush you through the door. Our drug rehab program will get you off the medication or illegal substances ruining your life. In the same manner, our alcohol rehab will teach you how to live without the ball and chain of booze. An addiction treatment for steroids addiction first requires that we deal with the pressing issues we specialize in dealing with. Fortunately, with the many treatment modalities our experts employ, you’ll find the answers you’re looking for. First, call us. You won’t regret it. In fact, many of the men who have graduated from our program point to that first call that saved their lives . . . as the turning point that finally made a difference. 855-491-7694.